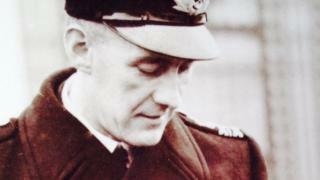 The life of a naval hero of World War Two has been commemorated, after secret documents were discovered in a suitcase. Cmdr Harold Wilkinson Goulding made dozens of clandestine landings in occupied Europe ahead of D-Day. He died in 1945 and his family only realised the extent of his role when papers were found in an attic in 2010. A flotilla of motor torpedo boats and a vintage aeroplane flypast has been held near his home in Hayling Island. As a merchant seaman before the war, he had an intimate knowledge of the French coast which was to prove invaluable to the military. His navigational skills were used by the secret intelligence service (MI6), the Special Operations Executive (SOE) and by the Commandos. As Commodore of Coastal Forces, Cdr Goulding ferried secret agents in and out of occupied territories and trained hundreds of other men at the shore bases which made up HMS Northney on Hayling Island. He conducted 70 landings in person - thought to be more than any other officer in World War Two. He was awarded the Distinguished Service Order (DSO) in 1941, but died of an illness aged 41, without being able to tell his family about his exploits. His granddaughter Jill Goulding began researching his wartime role after stumbling upon a locked case in the attic containing a stash of documents marked "most secret" or "top secret". She said the family were "busting with pride" at his achievements. "Secrecy meant that men like him never really got the credit which they deserved and that's something which I wanted to put right," she said. Ms Goulding organised a series of commemoration events on what would have been her grandfather's 106th birthday. Two blue plaques were unveiled at his former home and base in Hayling Island, along with a flotilla of World War Two canoes and motorboats and a Spitfire and Dakota flypast. She said about 300 people turned out for the event which she described as "amazing", adding: "Grandpa would have been very honoured."